Another highlight of the inauguration was the arrival of Barack Obama's limousine which has been offcially named "The Beast". Anyone who is familiar with Biblical prophecy knows that "The Beast" is the Biblical term for the Antichrist and so is the number 666. The Antichrist is also called Satan and the 'Prince Of Darkness' or 'Dark (black) Prince'. The number 666 appeared in Barack Obama's campaign commercials. For his mobile and campaign text messaging, he used the numbers (62262) which adds up to 666 when the "2's" are added together. Many evangelical Christians, youtube videos and websites are selling the belief that Barack Obama is the Antichrist or the "Prince of Darkness" found in Bible prophecy...and that's exactly what you're supposed to think! 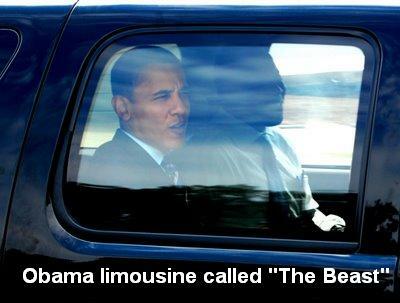 The corporate media spin doctors have been busily dropping all of the 'not so subtle' hints including naming Obama's limo "The 'Beast'. Why? Because when the real antichrist (Prince William) steps onto the world stage in 2015, the crime families want the public to accept William as the TRUE Messiah. According to Bible prophecy, the Christ Messiah cannot return until the Antichrist rules for seven years. By 2015, Obama will have ruled for 7 years! End Time propaganda is big business. Tim LaHaye's Christian fiction series called, Left Behind, has sold 63 million books which have been made into big budget movies. According to the Hebrew authors of the Bible, all hell is going to break loose… but is it the angry hand of god that will fulfill Bible prophecies or the greedy hands of the ruling crime families who have developed climate, biological, psychological and nuclear weaponry to accomplish the task? There are three guidebooks or documents that plot out a formula for a global takeover; Freemason Albert Pike’s Morals and Dogma, The Jesuit’s Protocols of the Learned Elders of Zion and the Bible’s Book Of Revelation. All three describe an apocalypse or third world war which will give rise to one world empire and ten rulers (Kings) under the command of a satanic global ruler. The Bible refers to this one world ruler as the Antichrist. He is described as handsome, charming, charismatic, a great speaker and a deceptive man of peace. He is prophesied to bring 3 1/2 years of peace beginning with a 'false Peace Treaty' in Israel. The second 3 1/2 years of his reign will be marked by unspeakable horrors called the 'Great Tribulation'. The most insidious part of the global takeover scheme by the ruling bankster families is that their media monopolies and church affiliates (World Council of Churches) have conned millions into supporting and even welcoming an apocalypse that will exhaust and de-populate the masses through deadly viruses, global terror, economic disasters, and nuclear war. Bible believers passively expect a magical ending to this global hijacking story. Instead of taking action to prevent it, they welcome the prophetic disasters as signs that Jesus is coming to rescue them in the “Rapture”. The shadow government of ruling crime families and their media monopolies are dropping hints to fool the public into believing that Obama is the Antichrist (which he is NOT). During the Obama Presdency, they are fulfilling 'end time' Bible prophecy beginning with Hillary's settlement of a peace treaty in Israel in 2009 followed by 3 1/2 years of 'false' world peace. Consistent with prophecy, Obama (like the Antichrist) will receive a near fatal head wound from an assassin and will survive to rule for another 3 ½ years following his re-election in 2012. Nobel Prize winner Doris Lessing predicted the assassination of Barack Obama as the first black U.S. president. Fooling the public is an important feature of the one world government and one world ruler agenda. Your smallest donation helps. Thank you!